The Open Hearth Acoustic welcomes Canadian/Irish band, Fásta, on Thursday, 9th July. Something of a coup for the club – the band being in Gwent, performing at the Folk on the Lawn festival at Tintern over the following weekend – and a sizeable audience is expected; early attendance is therefore encouraged. Folk doyen, Mike Harding, described Fásta as ‘Irish Music with a Quebecois Twist at its very, very best’. ‘invigorating’ said the Irish Times. 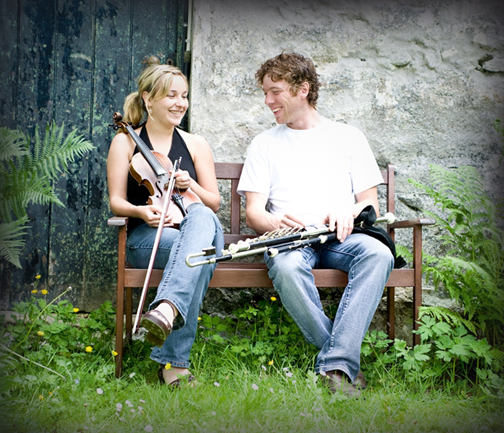 Their music is rooted in the fiddle playing and foot percussion of Quebecoise Canadian, Sophie Lavoie, and the uilleann piping and banjo playing of Fiachra O’Regan from Ireland. Much travelled (with appearances literally across the world), their infectious, rhythmic sound is sweetened all the more by the skilled, driven arrangements of their native Gaelic and French-Canadian songs and tunes. Fásta, in communication with us, pronounced a deep love for – and intimacy with – both their respective musical traditions. The basement bar doors of the Open Hearth will be open at 7.00pm. An open mic session with precede the band’s performance at about 9.15pm. A donation of £3 is requested.